Debbie is looking tanned and relaxed having just returned from a holiday in the South of France and is looking forward to doing more travelling later in the year. “For the past 4 years, I really cut back on holidays and trips – I even turned down an all-expenses paid offer to go to New York for a meeting at work. I just couldn’t face flying,” she says. Not that Debbie is afraid of flying – quite the opposite as she actually loves it. Her problems began with a series of bad colds about five years ago, when she went through a very bad relationship breakup. “I don’t think I was taking care of myself very well and I came down with every bug going. As a result I had a spell of being really run down and started to get sinusitis after every cold and suffered really horrendous sinus headaches,” she explains. Sinus headaches can be quite like migraines in terms of the intensity of pain. There are some important differences, however. The pain can be behind the eyes but it is not always on one side of the head. Both headaches have a throbbing quality, but sinus headaches tend to be worse in the morning and get better by the middle of the day. This is because the pressure in the sinus is made much worse by lying down and drainage of the sinuses once you get up really helps. For the same reasons, sinus headaches are much worse if you bend forwards or bend down – and if you experiences changes in air pressure during an air flight. “I used to wake every morning feeling like I had the worst hangover ever – but I don’t drink! The sinus pain used to take ages to clear and I would just be starting to feel normal again when I would get another cold and it would all start again. I went on a holiday to Spain and spent most of the time recovering as my headaches were so bad after the flight. The journey back was really bad and I was constantly sick with the pain – it really put me off going away,” says Debbie. For three years, Debbie struggled on but last year, after she consulted her GP and after three lots of antibiotics for bad bacterial sinus infections in three months, the doctor suggested that some tests would be a good idea. “She said that it was unusual for someone of my age to have so many bouts of sinusitis in a short time; she was also concerned that I had constant morning headaches that were interfering with my work and I was grateful for anything that was going to help,” remember Debbie. Fortunately, Debbie had a private medical insurance policy with work and within ten days she had an appointment with a private ear, nose and throat specialist who examined her sinuses with an endoscope. “I was given a full 7-day course of antibiotics between my referral and my examination, so that my sinuses were clearer than they had been for months; I was still feeling very congested though. The endoscopy results showed I had a collection of quite large polyps, which was a bit scary but at least I knew there was a reason for the way I was feeling,” she says. Sinus polyps are non-cancerous growths that arise in the lining of the sinus cavity and that can grow undetected until they grow large enough to interfere with normal sinus drainage. 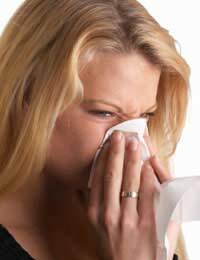 Then, the presence of polyps makes it more likely that infection will occur, increasing the risk of sinusitis and congestion. Debbie’s polyps had obviously been developing for years but the ENT specialist was able to remove them fairly easily using another endoscopy procedure, which took place later in the month. “The results were amazing – I was sore for a few days and was given another course of antibiotics but over the next month, my nose really cleared and I realised just how bad it was before. I can breathe easily now and I haven’t had an attack of sinusitis for 6 months. This holiday was my first trip for ages – and it went really well so I am looking forward to more now that my sinuses are under control,” she smiles.